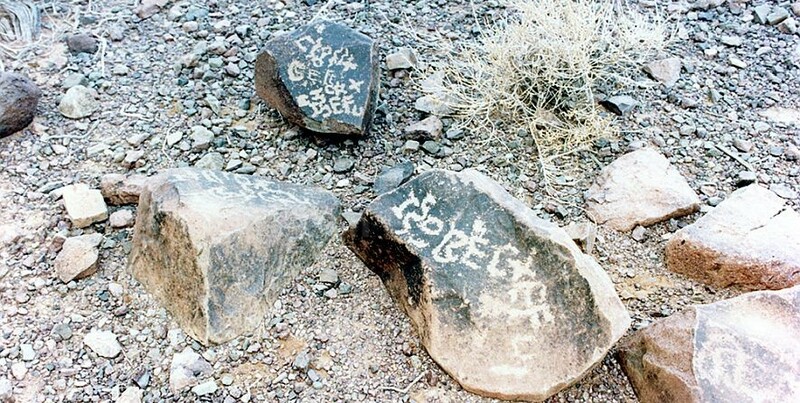 The Saudis have confirmed that there are hundreds of Thamudic inscriptions in the area around the Jabal Maqla mountain. The archaeologists commissioned by the Saudi government reject the notion that the inscriptions qualify as evidence of the Israelites having been there. However, at least two experts in ancient Hebrew inscriptions are confident that these proto-Hebrew inscriptions at Mount Sinai substantiate the Exodus account. Dr. Miles Jones, a scholar of ancient Hebrew and a historical linguist, has examined photographs of Thamudic inscriptions from the area. He concluded that they are proto-Hebrew and date back to the time of the Exodus, proving the presence of Hebrew speakers at that time. His analysis is supported by the independent work of Todd Eaton, another expert on proto-Hebrew inscriptions, who traveled to Jabal Maqla in the mid-1990s. He says he saw inscriptions with Hebrew lettering and depictions of sandals, menorahs, and shofars in the plain in front of Jabal Maqla. These two experts independently concluded that inscriptions near the “Split Rock” northwest of Jabal Maqla and near the mountain refer to Yahweh, the Hebrew name for God. Jim and Penny Caldwell, who used to work in Saudi Arabia and visited Jabal Maqla many times, reported finding countless inscriptions showing feet in sandals near the mountain and near the possible Split Rock of Rephidim site. It is written in Deuteronomy 11:24 and Joshua 1:3 that God told the Israelites, “Every place where you set your foot will be yours.” The Caldwells and the two aforementioned experts in proto-Hebrew drew a connection between these verses and the footprint inscriptions that appeared to be marking Hebrew territory. When Dr. Miles Jones observed the pictures originally taken by the Caldwells, he was stunned when he noticed three hash marks drawn next to the sandals in the inscriptions. He immediately recognized it as the proto-Hebrew origin of the Hebrew letter, kaph. The letter literally means “sole of the foot,” according to Dr. Jones. Footprint-tracing is a widely recognized sign of ownership. He believes this became the Israelites’ wasum, or tribal sign. Todd Eaton independently reached the same conclusion in the mid-1990s, long before before he was even aware of the Caldwells’ findings or the work of Dr. Miles Jones. He first began communicating with researchers about this topic in 2018. The Oldest Menorah Ever Found? Dr. Sung Hak Kim, a South Korean doctor who was once the personal physician to the Governor of Mecca, was granted wide-ranging permission to explore northwest Saudi Arabia because of his high-level friendships. The menorah is a very important symbol in Judaism, dating all the way back to the time described in Exodus 25:31-32 where the menorah is mentioned as an integral part of the tabernacle. The inscription of a menorah in this location is highly indicative of an ancient Hebrew presence. The sandal inscriptions found near the Split Rock are adjacent to a flat plain that may have been the battlefield where Joshua led an Israelite army to fight the Amalekites after they attacked the Israelite population from the rear, preying upon the most vulnerable who straggled behind. The Caldwells claim that they have found slingstones in the possible battlefield area. The location is consistent with what is currently understood about where the Amalekites resided, though little is known about the Amalekites overall. The Encyclopedia Brittanica states “The district over which they [the Amalekites] ranged was south of Judah and probably extended into northern Arabia.” The Jewish Encyclopedia likewise states that the Amalekites were in northern Arabia at this time. Additionally, Dr. Lennart Möller writes in The Exodus Case that the Amalekites were an Arabian people, the oldest tribe of Arabia and the founders of the city of Medina. Two inscriptions have been found to the south of Jabal Maqla that may refer to the battle with the Amalekites. However, this location poses some difficulties. It is a significant distance from the Split Rock location that is to the northwest of Jabal Maqla and indicates that the Israelites approached the mountain from the north. The below inscription found by the Caldwells was interpreted by Dr. Miles Jones to say, “Died Amalek.” The inscription shows where an Amalek (a member of the Amalekite tribe) died. It does not necessarily mean he was buried there. Todd Eaton interpreted it differently. He believes it is identifying the spot where a high priest died. If Dr. Jones is correct, then their placement near each other appears to record an event that is consistent with the Biblical account. A mother and her young daughter would be among the vulnerable “stragglers” towards were attacked by the Amalekites from the tear. Murdering a mother and daughter would certainly fit the Biblical description of a despicable sneak attack upon the weak by the Amalekites. If the nearby inscription states “Died Amalek,” then this could very well be where one of the Amalekite murderers of that Hebrew mother and daughter was killed. Again, these three inscriptions were found to the south of Jabal Maqla and were not among the inscriptions at the Split Rock, where the battle with the Amalekites is likely to have taken place if the Split Rock is the “Rock of Horeb.” Therefore, if the inscriptions refer to the battle with the Amalekites, then they are retelling the story. Dr. Miles Jones believes that the Amalekites attacked the Israelites multiple times, including during their stay at Jabal Maqla. The following inscription, photographed by the Doubting Thomas Research Foundation near the Split Rock, appears to confirm that this site was an encampment for Hebrew speakers. The book of Exodus names the Israelites’ encampment (and the location where they fought the Amalekites) as “Rephidim.” Most sources say that Rephidim means “place of rest.” Other sources say it means “supports,” referring to how it strengthened or rejuvenated the Israelites. Eaton told us that this inscription is expressing gratitude to Yahweh for providing a ram. This may be a reference to the ritual animal sacrifices practiced by the Israelites at this time. Dr. Miles Jones and Todd Eaton have independently come to the conclusion that the proto-Hebrew inscriptions in the area indicate that the alphabet, and therefore literacy, originated from this area of Saudi Arabia and is part of the Exodus story. In his book, The Writing of God, Dr. Miles Jones argues that God made a “literacy covenant” at Mount Sinai with the Israelites. God’s forbidding of graven images on rock forced the Israelites to read, write and evolve from hieroglyphic communication to an alphabet. God provided a “literacy covenant” at Mount Sinai with the Israelites according to this theory. Graven images on rock were forbidden in order to force the Israelites to read, write, and evolve from hieroglyphic communication to an alphabet, beginning modern literacy..
Todd Eaton independently reached a similar conclusion after viewing the inscriptions first-hand. He also theorizes that the Hebrew alphabet was taught using the stars in the Ecliptic plane. He says he noticed that the alphabets appear in the stars when he slept outside at Jabal Maqla with a consistent orientation. The letters become visible in the sky from right to left, which is how Hebrew is read. The proto-Hebrew inscriptions at Mount Sinai offer a fascinating piece of evidence for the theory that Jabal Maqla is the correct location for the Exodus account. Lennart Möller, The Exodus Case, 4th ed. (Copenhagen, Denmark: Scandinavia Pub. House, 2010), 278. Are you claiming that these escaped slaves knew how to write and to use this proto Hebrew alphabet? Actually, they knew how to write and read because; there was an old alphabet that they knew, which was the proto-Sinaitic. That alphabet date to the tine that Joseph was in changer of everything in ancient egyp which btw he is the one who creates the alphabet. Interesting “Doubting Thomas”-type question. But obviously the first alphabet was developed by some group. It should logically have developed among the people closest to reality and most easily persuaded by evidence. In other words by the smartest people in the world. That is, for example, NOT those who worshiped comic book fantasies whose existence had not a crumb of evidence, but who worshiped God whose incredible miracles, observed by millions, were the reason they were alive. Reder’s question implies that the Egyptians with their education would have been the more logical womb of the alphabet, despite being gullible as bricks for the superstitions they believed. But they had so much pride in their hieroglyphics that they scratched them all over their tombs and monuments. What would motivate them to improve? Do you know how much humans resist changing their habits just because a new one is better?